When I visited Colombia a few years ago, one of the first desserts I wanted to have was obleas con arequipe, which are big wafers filled with what most of you, or many of you know as dulce de leche. In Colombia we call dulce de leche, arequipe, in Mexico it is called cajeta, and in Perú, Chile and Bolivia it is called manjar blanco. 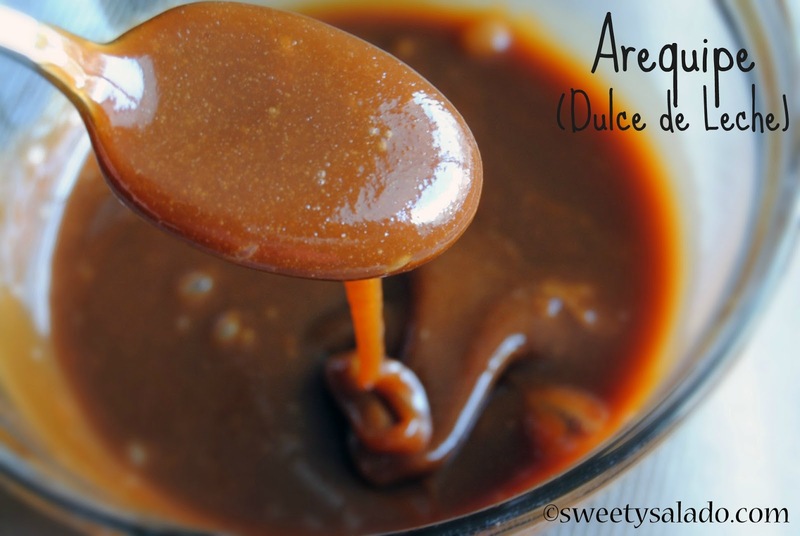 But it really doesn’t matter what you decide to call it, arequipe is one of those amazing sweet treats that not only goes with almost everything, it is also really easy to make. Most people like to make arequipe by boiling a can of sweetened condensed milk in water in either a regular pot for about 3-4 hours, a pressure cooker for about an hour and half or even a slow cooker for about 8 hours. Why? Because you only need two ingredients to make it, the can of condensed milk and water, that’s it. You boil it, let it rest and then open it. I, on the other hand, prefer to make it from scratch to avoid adding preservatives but mainly because the taste is way superior to what you get from the boiled condensed milk, the difference is light and day. I do have to say that the good thing about using the can of condensed milk is that you can choose how dark or light you want your arequipe to be. If you want it darker, you boil it for a while longer, if you want it lighter, then you can take it out of the boiling water sooner. Another thing is that you can make a few cans at once and end up with a ton of arequipe, which I’m sure no one will complain about that. The recipe that I’m sharing with you is the basic way of making it from scratch, something that people have been doing for many years. You just need milk, sugar, vanilla and baking soda which is what gives it that rich brown color. Don’t be intimidated, making arequipe is very easy and like I said, if you make it from scratch the flavor is incredible. 1. In a large pot, mix milk and sugar. Bring to a simmer over medium heat stirring occasionally until sugar dissolves. 2. Add vanilla extract and baking soda, lower heat to low and simmer uncovered for about 1½-2 hours or until you reach a brown, caramel color and it has reduced to about one cup. Stir occasionally and remove the extra foam that forms on top. 3. Strain any clumps by using a fine mesh strainer and store in the refrigerator in an airtight container for up to one month. Can I double this recipe? Triple? 🙂 thanks! Can I do this recipe in a slow cooker? Thanks! I love your blog. My husband and I are both Colombians and had been trying to find Colombian recipes with American ingredients but we failed several times. So far we've made empanadas, pandebonos, buñuelos, hojuelas, sancocho, ají, arepa de huevo, papa salada… I really want to try to make arequipe but the long cooking time scares me a bit. I saw in another blog's comments that you could do it in the slow cooker but I have not found any real recipe (only with condensed milk 🙁 )Do you know how to make milhojas? I would love to see that recipe.I'm sorry! I got carried away. Thanks again for your recipes!! So do you have to keep it for a month before using or you can use it right away? You can use it right away but you can store it in the fridge for up to one month before it starts going bad. Hi,I was just wondering if you need to use whole milk or regular? And does this recipe thicken like the dulce de leche used in your alfajores video?Thanks. Hi there! Yes, you should be using whole milk, which many people call regular milk, because of the higher fat content. And once the dulce de leche cools completely, you'll end up with a very thick texture, perfect for making alafajores. So I just Madeline dulce de Leche and did not realize that once it starts bubbling you have to stir consistently! I let it go for ten minutes and the bottom burned 🙁 is that normal or should o be stirring consistently by the end? I was able to salvage a little more than a cup though (I made a bit more than then recipie suggested). Also, it's very very thick, will it completely harden in the fridge? Should I reheat before putting it on the cookies? Thanks! Hello Juliet, you don't have to constantly stir it but if it was sticking to the pot, then you need to lower the heat a bit more. And yes, it comes out thicker than the dulce de leche that is made by boiling a can of condensed milk but it should still be spreadable. When I took it out if the fridge it was quite hard and not spreadable. Will warming it up help? Any suggestions? Sorry for all the questions! It was my first time making it. 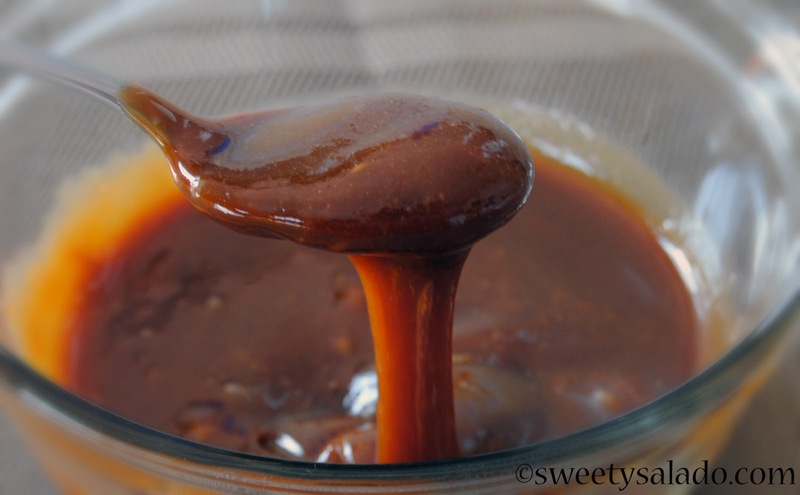 If your dulce de leche is completely hard, that means the temperature was too high. When you boil sugar at a high temperature, it crystallizes and that's why it hardens. You need to simmer the milk with the sugar on low heat, meaning it should not be a hard boil but a slow simmer, that way the sugar will thicken but not harden. Can I use non-fat milk and still get equally great results? I have never tried it with non-fat milk but a few of my followers have and they told me the end result was not the same. I guess the texture came out differently. Don’t add the baking soda when it is at a simmer, huge mistake on my part. With a big clean up! My bad! !